Robby Armstrong still remembers it like it were yesterday. He was fourteen years old, and at his girlfriend’s home. Always having an interest in music, he reached for her father’s guitar. He picks up the story. In addition to radio airplay, the California native is also excited about the exposure that “Rodeo” (along with two other of his songs) will soon be receiving in the upcoming Cameron Diaz – Colin Firth film Gambit. Armstrong will also have an acting cameo in the film. Though Robby lives in California today, he has made many trips to Nashville – including writing appointments with heavy hitters as Liz Rose and Radney Foster. In addition to building his career, Robby’s heart has led him and his wife to help several causes in the Long Beach area – from homeless children to animal adoption. He serves as musical director for a Public Television show in the Seal Beach area, he puts a pet on camera each week, and writes a song on the spot about the animal – usually resulting in an adoption. 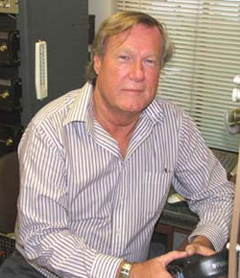 Armstrong also hosts his own show in the area that has resulted in revealing interviews with such musical notables as writer and producer Darrell Brown and the legendary engineer Niko Bolas (who also engineered Robby’s album). The program was awarded an honor from the WAVE awards, placing in the top three of over 500 entries. He also produced the musical score for an eBook/app titled, Samuel T. Moore of Corte Magore. The project will be released on iTunes July 1st and will be sold as a downloadable iPad app. Samuel T. Moore of Corte Magore was written by Tonia Allen Gould and is partially illustrated by one of the original creators of SpongeBob Square Pants, “Mr. Lawrence” who, incidentally, is also the voice of Plankton from the hit, animated series by Nickelodeon. His heart also is in full evidence when he is on stage, where just like with his records – he loves mixing it up. “I’m always looking for an angle to make people laugh. The show has a lot of energy, as well as heart and soul. If you took Bruce Springsteen, John Cougar, and Mick Jagger, and they all had a baby…it would be me,” he says with genuine laughter. Armstrong and his band can be found playing each and every weekend of the year, and if that wasn’t enough, he also does acoustic shows at various venues during the week. In addition to his vocals and stage prowess, his instrumental work also dazzles those in the audience on a regular basis. Living for the moment. 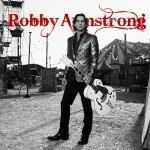 That’s Robby Armstrong.